Geoff “iNcontroL” Robinson and Dan “Artosis” Stemkoski are two of the StarCraft community’s most beloved personalities. In the early 2000s, they competed in StarCraft: Brood War; later, they became professional StarCraft II players, shoutcasters, and expert denizens of the analyst desk. Now they’ve started The Pylon Show, which focuses on the competitive scene of both StarCraft games. Four episodes have already been recorded, with new broadcasts every Thursday at 2:00 CEST. We caught up with Geoff and Dan to find out more. What’s unique about your new show? Geoff “iNcontroL” Robinson: There’s something cool about the guys who have been around the entire time, and are able to throw it back, and make everybody feel included. StarCraft has this “legacy” feeling for a lot of people who weren’t necessarily there the whole time. They came in and out, life took them away, or whatever . . . but we’re able to talk about it and make it real for them. Dan “Artosis” Stemkoski: StarCraft has been out for 20 years, and Geoff and I have been there basically since the beginning. I know Geoff even played the beta of StarCraft I. I’m not quite there, but I started playing it right away. The longest I’ve ever been away from StarCraft—I believe there was like a month or two where I didn’t play, in 2005 or something like that. It was not more than 50 days. iNcontroL: That’s a funny story. Artosis: (Laughs) Which story, Geoff? iNcontroL: Well, he trained so hard for this thing, and for so long, that when it didn’t happen, he needed to take a break. Artosis: In 2004 I trained so hard for [the World Cyber Games (WCG)], and made it. 2005, I trained even harder, and then lost to Day—that’s that famous footage you can see—and the disappointment was so soul-crushing that, afterwards, I just kinda didn’t look at StarCraft for one or two months. It was hard for me to log on at that point, because I had put everything into it and failed. iNcontroL: StarCraft players always come back. Artosis: (Laughs) Yeah, I didn’t have any notion that I was not going to come back. It just really hurt, and . . . I think I needed a break. When I was training back in the day, man, I would train 12 to 16 hours every single day. I was so caught up in it . . . I had a small sponsor that year and they had a cameraman come down, that’s why that footage existed. Because they thought I was gonna win WCG, and I thought I was gonna win WCG, and it was just such a disappointment. I guess it stopped hurting so much, and I was like, alright, time to start practicing again! What was your story during that era, iNcontroL? iNcontroL: I qualified in 2004 to go to the [WCG] finals, but I was a broke student at the time. They wanted you to fly to LA, and I couldn’t do it! A couple years later, in 2007 . . . This is a story that makes me cry every time, but my mom skipped rent so I could go to Florida. I won the national championship there, and that basically started my entire life. From there I was qualified for Mexico, and then for New York; they wanted me to be on a reality show, [team Evil Geniuses] signed me, and the rest is history. My whole life was shaped by the sacrifice my mom made for something I was really passionate about. Do you remember your first impressions of each other? 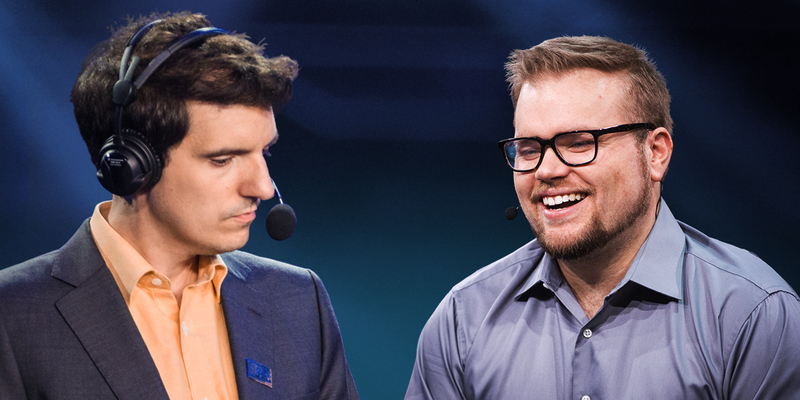 iNcontroL: Online, because we ran in different circles, Dan seemed very quiet to me. But he was reliable. If we had a Nation Wars [tournament], Dan was there. If I could get him a TvT [Terran vs. Terran], Dan was happy. But a lot of times, after a few of those TvTs, I’d have to have talks with the other team’s captain, because Dan might have had a few choice words for his opponent. . . .
iNcontroL: We met each other at the 2007 [WCG] finals [in Florida]. We hung out after the event . . . it was like we were all family! We were all poor college students, or in that age group, and we were just so thrilled to be there. It was an incubation chamber for friendship. Artosis: I might have seen a picture of Geoff beforehand, I’m not 100% sure—again, we didn’t hang out online that much—but it’s funny, most StarCraft players were these skinny nerds, and Geoff was there in a muscle shirt. I think he had a tattoo at the time. He could and did pick up several of us at once . . . he was much more athletic than everyone. He was wearing a tight black muscle shirt without sleeves. And he was beating all of us in StarCraft. Let’s get back to the new show. What would you say your main goal is? iNcontroL: Celebrating the people who make StarCraft great. Players, tournament organizers, managers, anybody. One of the things I’ve found is that—it’s amazing—every time I meet a new StarCraft person, I genuinely really like them! Artosis: After State of the Game was gone I made my own show, Meta. But the thing is, if you let me run amok on my own, I get too into strategy and the technicalities of the game. That’s just where my brain goes for happiness. But I enjoy these other parts, and this show is going to hit those other parts as well. It’s going to cover all of StarCraft I and II. What is it about StarCraft that enables you to talk about it day in and day out? What makes it so special? iNcontroL: It is special. Well, you’re kicking a wasps’ nest right now. Dan and I will try to cut our speech down to two or three minutes—it is an hour-long speech. StarCraft grabbed me because no matter how good you get, there’s someone better. There’s a skill ceiling that’s unachievable. So it’s this incredible Mount Everest of a game, but it’s fair. You reward yourself with learning new things, and speeding up, and putting in work and seeing results. Dan and I call it the best game ever made, and we believe that. It’s coming up on its 20th year to celebrate. It’s been around that long, there’s a lot that’s happened, there’s a lot that will happen, and we love to talk about it. Artosis: The game just keeps getting better the older it is. That’s both StarCraft and StarCraft II. When we say StarCraft, we mean both. In general, StarCraft is the new chess—except it’s much deeper than chess. It’s so deep, there are so many things that are still being discovered—that infinite skill cap that he talks about . . . Everyone can play these games, and they’re just—I dunno, they’re beautiful! Where’s StarCraft headed in a year or five, based on what you’ve seen so far? iNcontroL: Hard to say! I think StarCraft is in its best place ever. Legacy of the Void has the best gameplay, and with StarCraft: Remastered we have a resurgence in the original game as well. Five years is a long time, but I'd love it if we still had our thriving progamer scene and people hungry to play StarCraft. Anything else you want to get out there about the show? Artosis: I think there will be a lot of experimentation. We’ll try a bunch of different things. Geoff and I will be talking about it, and reading all the feedback, and seeing what people like, and what they don’t like—we’re very passionate about this, and want to make this a great show that will go on indefinitely. Whatever’s going to make that work. What's the story behind the name "The Pylon Show?" The Pylon Show airs on iNcontroL’s Twitch.tv channel, Thursdays at 2:00 CEST, with VODs available on YouTube. Look for the first episode in March 2018. Follow iNcontroL and Artosis on Twitter for more updates!